One of the things that makes the web work is links. Links to content, pictures, videos and more. When we follow those links and we find interesting content, we read it, watch it, and enjoy it. From the beginning to the end. Whether those links we clicked on were from a social media site like Twitter or Facebook, on a search engine like Google, or from within the site itself … this type of activity is called Content Marketing. It is the act of getting people to engage with content. It is through the production of great content that is the actual act of marketing for web publishers. I was on a site called University Herald, reading an article by Steven Bickard about Elon Musk and top 5 man crushes. Elon Musk is amazing and has had an incredible year, more on that in another post. 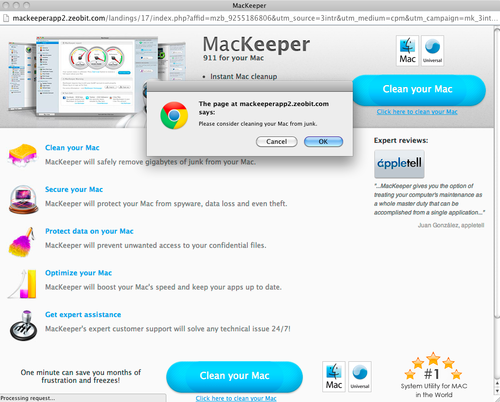 Mackeeper … trying to install some software on my computer where they can spam me more. This is a big time fail. These are ads sold by Taboola. User beware. This entry was posted in Uncategorized and tagged ads, content marketing, fail, user experience. Bookmark the permalink. ← After a really good 2013, what will 2014 hold for us?